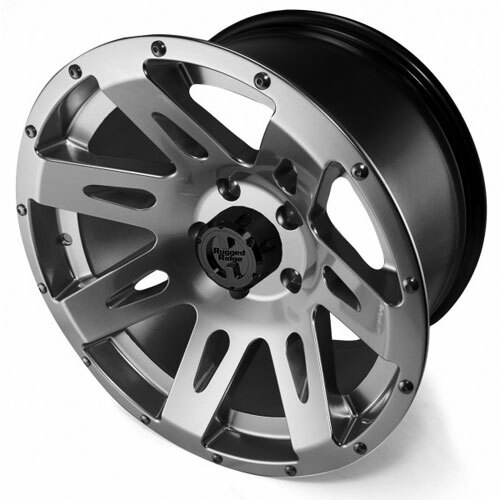 This aluminum XHD Jeep wheel from Rugged Ridge measures 17 x 9-inches and has a gun metal powder coat finish. It has a 5 on 5-inch bolt pattern and 4.75-inch back spacing. 2007-2018 Jeep Wranglers Jk 2 Doors. 2007-2018 Jeep Wranglers JK 4 Doors. This hub-centric design precisely centers the wheel over the hub providing proper balance, clearance for brake rotors, steering components and suspension. Better fit, no wheel vibration! Stainless steel button-head socket cap screws around the perimeter of the outer wheel face give a great 3-piece look. Each wheel includes a UV-treated black center cap that replicates a manual hub for that off road look. Rugged Ridge wheels have been independently tested and certified to meet/exceed SAE J2530 standards for wheel strength and durability. Limited lifetime structural warranty and 1 year finish warranty. Backspacing is 4 9/16” with a 12mm offset.